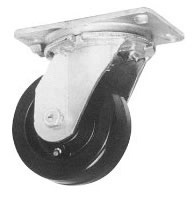 Featuring a heavy duty hot forged, zinc plated top plate and yoke, the #50 series is an excellent heavy duty caster. It contains a deeply grooved double ball bearing raceway swivel head for exceptional performance. Brakes, seals, thread guards, and bearings options are available. All components are of high quality and heavy duty construction to withstand regular use and strain. #50 series can be used for heavy duty platform trucks, steer trailers, towline carts, fixtures and racks, welding tables, power drawn equipment, and any heavy duty application. Rubber on Aluminum 400 NCC-50S420-RAR 7.26 NCC-50R420-RAR 5.7 "
Rubber on Polyurethane 450 NCC-50S420-TPRR 6.16 NCC-50R420-TPRR 4.6 "
4" 2" Polyurethane on Polyolefin 700 NCC-50S420-PPUR 6.16 NCC-50R420-PPUR 4.6 "
Polyurethane on Steel 700 NCC-50S420-PUR 8.36 NCC-50R420-PUR 6.8 "
Solid Polyurethane 700 NCC-50S420-SPUR 6.16 NCC-50R420-SPUR 4.6 "
Poly on Aluminum 800 NCC-50S420-PAR 7.26 NCC-50R420-PAR 5.7 "
Cushion PU on Polyolefin 700 NCC-50S420-SCR 6.12 NCC-50R420-SCR 3.06 "
Semi Steel 700 NCC-50S420-SSR 7.92 NCC-50R420-SSR 6.36 "
Heavy Duty Steel 900 NCC-50S420-SSR-HD 8.5 NCC-50R420-SSR-HD 5.4 "
4" 2" Ductile Steel 1500 5-5/8" NCC-50S420-DSR 8.7 NCC-50R420-DSR 5.6 "
EZ Rolling Ductile Steel 1600 NCC-50S420-CDSR 8.7 NCC-50R420-CDSR 5.6 "
V Groove 1000 NCC-50S420-VGR 8.91 NCC-50R420-VGR 7.35 "
Polyolefin 450 NCC-50S420-POR 6 NCC-50R420-POR 4.5 "
High Temp Phenolic 800 NCC-50S420-PHR-HT 6.5 NCC-50R420-PHR-HT 3.4 "
Rubber on Steel 450 NCC-50S520-RSR 8.36 NCC-50R520-RSR 6.8 "
Rubber on Aluminum 500 NCC-50S520-RAR 7.5 NCC-50R520-RAR 5.75 "
Rubber on Polyurethane 500 NCC-50S520-TPRR 6.82 NCC-50R520-TPRR 5.26 "
Polyurethane on Polyolefin 750 NCC-50S520-PPUR 6.82 NCC-50R520-PPUR 5.26 "
Polyurethane on Steel 1200 NCC-50S520-PUR 8.8 NCC-50R520-PUR 7.24 "
Solid Polyurethane 1000 NCC-50S520-SPUR 6.82 NCC-50R520-SPUR 5.26 "
Poly on Aluminum 900 NCC-50S520-PAR 7.48 NCC-50R520-PAR 5.92 "
5" 2" Cushion PU on Polyolefin 750 6-1/2" NCC-50S520-SCR 6.82 NCC-50R520-SCR 3.72 "
EZ Rolling Poly on Steel 1200 NCC-50S520-EZPUR 9.8 NCC-50R520-EZPUR 6.7 "
Semi Steel 1000 NCC-50S520-SSR 10.12 NCC-50R520-SSR 8.56 "
Heavy Duty Steel 1200 NCC-50S520-SSR-HD 11.12 NCC-50R520-SSR-HD 8.02 "
Ductile Steel 1500 NCC-50S520-DSR 11.15 NCC-50R520-DSR 8.05 "
EZ Rolling Ductile Steel 1200 NCC-50S520-CDSR 11.15 NCC-50R520-CDSR 8.05 "
V Groove 1100 NCC-50S520-VGR 10.78 NCC-50R520-VGR 9.22 "
Polyolefin 650 NCC-50S520-POR 6.75 NCC-50R520-POR 5 "
Phenolic 1000 NCC-50S520-PHR 7 NCC-50R520-PHR 6.75 "
Rubber on Steel 500 NCC-50S620-RSR 9.9 NCC-50R620-RSR 8.34 "
Rubber on Aluminum 550 NCC-50S620-RAR 10 NCC-50R620-RAR 8.5 "
Rubber on Polyurethane 550 NCC-50S620-TPRR 8.26 NCC-50R620-TPRR 6.5 "
Polyurethane on Polyolefin 900 NCC-50S620-PPUR 8.26 NCC-50R620-PPUR 6.5 "
Polyurethane on Steel 1200 NCC-50S620-PUR 12.78 NCC-50R620-PUR 11 "
Solid Polyurethane 1200 NCC-50S620-SPUR 8.26 NCC-50R620-SPUR 6.5 "
6" 2" Poly on Aluminum 1000 7-1/2" NCC-50S620-PAR 9.7 NCC-50R620-PAR 8 "
Cushion PU on Polyolefin 900 NCC-50S620-SCR 8.26 NCC-50R620-SCR 5.16 "
EZ Rolling Poly on Steel 1400 NCC-50S620-EZPUR 14 NCC-50R620-EZPUR 10.9 "
Semi Steel 1200 NCC-50S620-SSR 11.78 NCC-50R620-SSR 10 "
Heavy Duty Steel 1400 NCC-50S620-SSR-HD 13.75 NCC-50R620-SSR-HD 10.65 "
Ductile Steel 1600 NCC-50S620-DSR 14 NCC-50R620-DSR 10.9 "
EZ Rolling Ductile Steel 1600 NCC-50S620-CDSR 14 NCC-50R620-CDSR 10.9 "
V Groove 1200 NCC-50S620-VGR 14.32 NCC-50R620-VGR 12.5 "
Polyolefin 750 NCC-50S620-POR 8 NCC-50R620-POR 6.25 "
Phenolic 1200 NCC-50S620-PHR 9.5 NCC-50R620-PHR 7.75 "
HIGH TEMP Phenolic 1400 NCC-50S620-PHR-HT 9.5 NCC-50R620-PHR-HT 6.4 "
6" 2-1/2" Polyurethane on Steel 1600 7-1/2" NCC-50S625-PUR 15.75 NCC-50R625-PUR 14 "
Semi Steel 1600 NCC-50S625-SSR 15 NCC-50R625-SSR 13.25 "
Phenolic 1600 NCC-50S625-PHR 12.75 NCC-50R625-PHR 11 "
Rubber on Steel 600 NCC-50S820-RSR 14 NCC-50R820-RSR 12.25 "
Rubber on Aluminum 600 NCC-50S820-RAR 10 NCC-50R820-RAR 8.25 "
Rubber on Polyurethane 600 NCC-50S820-TPRR 10 NCC-50R820-TPRR 8.25 "
Polyurethane on Polyolefin 950 NCC-50S820-PPUR 10 NCC-50R820-PPUR 8.25 "
Polyurethane on Steel 1400 NCC-50S820-PUR 15 NCC-50R820-PUR 13.25 "
Solid Polyurethane 1400 NCC-50S820-SPUR 10 NCC-50R820-SPUR 8.25 "
8" 2" Poly on Aluminum 1100 10-1/8" NCC-50S820-PAR 10 NCC-50R820-PAR 8.25 "
Cushion PU on Polyolefin 950 NCC-50S820-SCR 10 NCC-50R820-SCR 6.9 "
EZ Rolling Poly on Steel 1600 NCC-50S820-EZPUR 16.25 NCC-50R820-EZPUR 13.15 "
Semi Steel 1400 NCC-50S820-SSR 15 NCC-50R820-SSR 13.25 "
Heavy Duty Steel 1600 NCC-50S820-SSR-HD 16.5 NCC-50R820-SSR-HD 13.4 "
Ductile Steel 1600 NCC-50S820-DSR 17 NCC-50R820-DSR 13.9 "
EZ Rolling Ductile Steel 1600 NCC-50S820-CDSR 17 NCC-50R820-CDSR 13.9 "
V Groove 1400 NCC-50S820-VGR 16 NCC-50R820-VGR 14.25 "
Polyolefin 1000 NCC-50S820-POR 10 NCC-50R820-POR 8.25 "
Rubber on Steel 800 NCC-50S825-RSR 16 NCC-50R825-RSR 14.25 "
8" 2-1/2" Polyurethane on Steel 1600 10-1/8" NCC-50S825-PUR 17.25 NCC-50R825-PUR 15.5 "
Semi Steel 1600 NCC-50S825-SSR 17.25 NCC-50R825-SSR 15.5 "
Phenolic 1600 NCC-50S825-PHR 13.5 NCC-50R825-PHR 11.75 "
10" 2-1/2" Polyurethane on Steel 1600 11-1/2" NCC-50S1025-PUR 19.75 NCC-50R1025-PUR 18 "
Semi Steel 1600 NCC-50S1025-SSR 23 NCC-50R1025-SSR 21.25 "
Phenolic 1600 NCC-50S1025-PHR 16 NCC-50R1025-PHR 14.75 "